JH came in today with this brand spankin’ new pair of handsome Allen Edmonds dress shoes. When I turned the shoes over however, I was shocked and dismayed to discover the heel of the right shoe was cadywompus and twisted to the left at a funny angle. This was obviously missed by quality control and easily overlooked in the store. 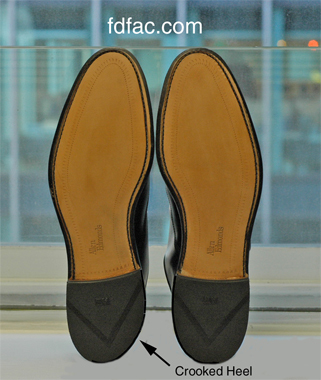 The purpose of this post is not to slam Allen Edmonds, but rather to show you how all shoes need to be thoroughly checked before taking them out of the store for a spin. With millions of shoes being inspected each day, there are bound to be a few which should not have passed quality control and do.